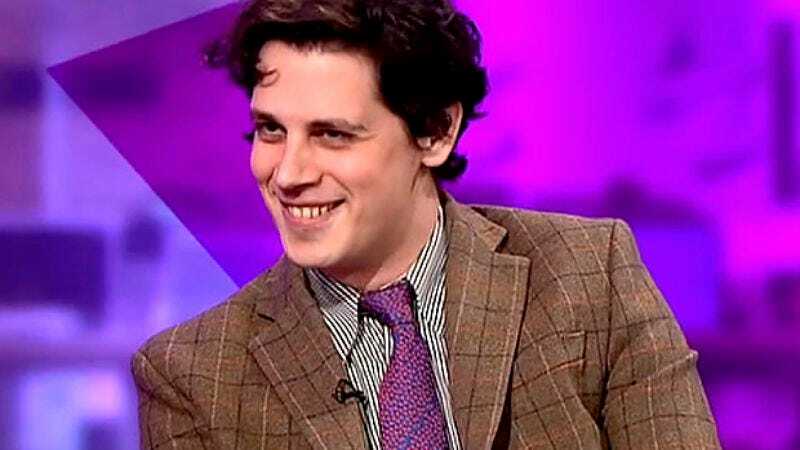 Over the last several years, “alt-right” firebrand Milo Yiannopolis has mobilized a rabid fan base of noxious, mouth-breathing racists by exploiting his status as a gay man who nevertheless embraces the right’s misogyny, Islamophobia, and general lack of inclusivity. Well, now that our laughter’s dying down in the wake of pro-pedophilia comments from Yiannopolis that cost him a Simon & Schuster book deal, a keynote speaker gig at the Conservative Political Action Conference, and his job as an editor at Breitbart, maybe now’s a good time to ponder just how he became such an icon among Twitter users with anime avatars. Hey, maybe it was this impassioned defense of Digimon that he wrote for Breitbart back in 2014, when the conservative site was presumably trying to become the next Kotaku. While we hate to send anyone to the dusty, shadowy corners of the internet where Breitbart huffs and puffs, the article provides a window into how Yiannopolis can apply his bloviating prose, $5 word choices, and fierce commitment to dividing fan bases to nearly any topic. But nowhere in the Pokémon canon exist the moments of maturity, complexity and artistic achievement that Digimon, at its best, has offered its fans. The investment required to wade through poor releases and boring anime and seek out moments of sublimity is the sort of journey only a true aficionado can appreciate, and it is that ravenous, determined and intellectually curious nature that marks out the Digimon fan. Digimon fans are the Wagnerians of video game and anime culture. Later, Yiannopolis eerily forecasts his own rise and fall in a treatise on Pokemon protagonist Ash Ketchum. Ketchum, then, has been full of sound and fury, but has achieved nothing. He is ageless, stuck in purgatory, devoid of accomplishments and character development. Unlike other successful kids’ entertainment brands, such as Harry Potter, he has not grown with his audience: instead, his audience continually grows out of him. It must be a lonely way to live–though it has, irrespective of its lack of artistic and cultural interest, been a lucrative existence for his makers. Yes, Milo, it must be a lonely way to live, as it seems you’re on the verge finding out. But, if your endless posts about the cost of your clothing are true, it’s certainly been lucrative, hasn’t it?